The beach-front town of Dominical in the Puntarenas province of Costa Rica is a popular tourist locale, especially for surfers. While surfing is certainly a draw for this area, you can't help but love and admire the glorious sunsets and natural beauty at every turn. High mountains, mangroves, coves, sparkling green water, and the two national preserves are huge reasons to visit Dominical. 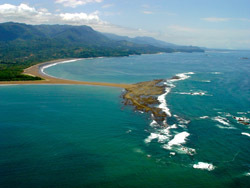 Just to the south is Marino Ballena, an unusual land mass in the shape of a whale fluke. A totally underwater national park provides a look at multi-colored marine creatures, coral reefs and volcanic rocks. Most of Dominical, especially to the south, is unpopulated. The area is rich with wildlife. Toucans, giant green & red iguanas, monkeys, parrots, three-toed sloths, jaguarundis and montegordos, just to name a few.